A magnificent pair of quality red walnut art nouveau / arts & crafts armchairs; featuring a fretted top rail with hearts and shamrocks. These arts & crafts armchairs have a large upholstered back support with sprung upholstered seat and arms. You may notice that there are matching shamrocks carved in the side arms. The chairs are covered in their original material, and still retain all of their original brass and porcelain castors. 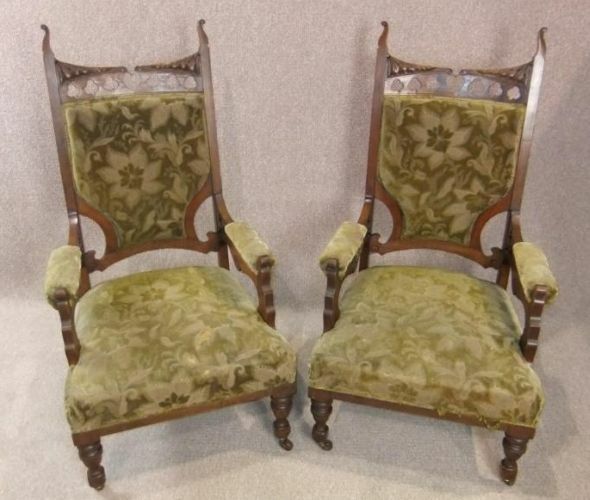 These arts & crafts armchairs are in good, sound condition, including the sprung seat pads. Sadly, the top coat of material is badly worn, but the material can be replaced at very little cost. This is a magnificent pair of rare and unusual arts & crafts armchairs. Please contact us if you require a quote for the upholstery work. If you like our arts & crafts armchairs, you will love our full range of antique furniture. Click here to view.